Up your sleep quality, and you'll up your quality of life. Sleep (and good quality sleep!) is the latest health trend these days — and rightfully so. All the best in the health and wellness biz (from fitness guru Shawn Stevenson to our very own Arianna Huffington) are talking about it and writing bestselling books. 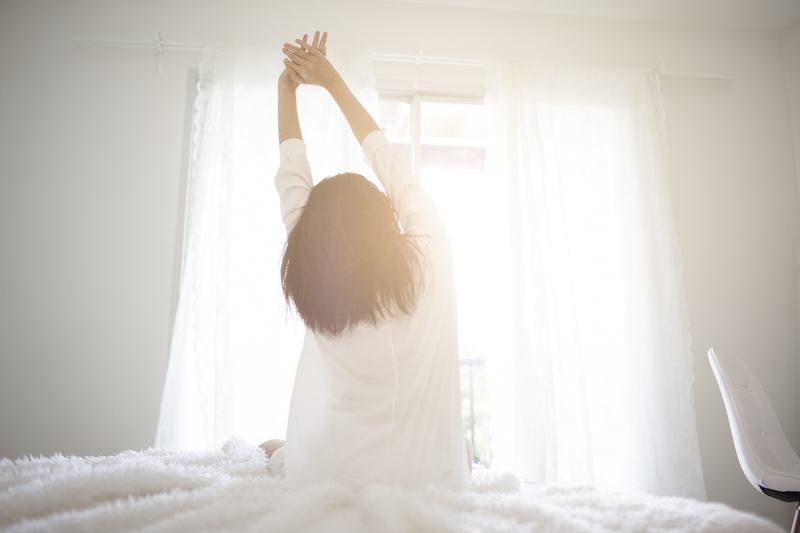 Well, World Sleep Day is on March 17 — so now is the perfect time to focus on upping your sleep quality which will consequently up your overall quality of life. And I’m here to talk about ways to improve beauty sleep naturally for all of us! We’ve all heard we need 7 to 9 hours a night to perform at our personal and professional best — but rarely do most of us get that. If we do, it’s often light and interrupted. Am I right? Well, I’ve got 2 little girls, a full time job, a 60–90 minute commute, a house to clean, a blog to update — and a couple writing projects on the side. But I get my 7–8 hours of sleep every single night! It’s the only way I’m able to get all my things done. To be productive and efficient with your time, I’m a firm believer that you should prioritize your zzzs. Everyone needs a thneed? No. Everyone needs their zzzs! So here’s what I do and what I recommend for you! GO TO BED AND WAKE UP AT THE SAME TIME EVERY SINGLE DAY. Unless I have a party or a music show I have to go to, I go to bed at the same time every night. It keeps the hormone cycle regular. STOP FEEDING YOURSELF AT LEAST 3 HOURS BEFORE BED. I’m not saying go to bed hungry. Just don’t go to bed full. This way you won’t suffer acid re-flux, bloating discomfort or brain fog when you wake up. EAT GOOD HEALTHY FATS AND PROTEIN FOR DINNER. I like to fill up with good healthy fats and low mercury fish at dinnertime. Omega 3s in low mercury fish provides the brain with the fuel it needs to repair and good healthy fats (coconut oil, avocado, grassfed butter) helps your body produce its necessary sleep hormones! Yum and done! EXERCISE AND HAVE YOUR COFFEE IN THE MORNING. No one needs to be jacked up and ready to take on the world hours before R.E.M. I remember in my world before kids, I used to train in taekwondo for 3–4 hours after work. I’d get home at 11:00 pm and be wired. I couldn’t wind down for another couple of hours. Thankfully, I’ve switched that up and focus on training in the mornings or over my lunch break. And I stick to coffee before 1:00 pm. READ A BOOK AND HAVE SOME CHAMOMILE TEA. There’s nothing more soothing and luxuriating than feeling the paper of a book underneath your fingertips. But try not to stay up with horror or mystery books that will keep you wired and wired for nightmares! I love good inspiring autobiographies, memoirs and health/wellness books. I’m reading Sheryl O’Loughlin’s “Killing It!” and Kareem Abdul Jabbar’s “Writings on the Wall” now. KEEP THE ROOM QUIET OR TRY SOME WHITE NOISE. Now I live in a home in a quiet residential neighborhood — so my surroundings are so peaceful I actually hear the birds chirping in the morning. But before I lived here, I lived in a condo in a busy commercial neighborhood — so with all the sirens and car alarms and parties going on with my neighbors, I turned to the trusty white noise machine. People like the rain or the forest — I was a sucker for the ocean waves. ELIMINATE GLOWING SCREENS. This includes, cell phones, radio digital clocks, television sets and computers! And make your room pitch black! Which leads to…. ILUMINAGE FACE MASK. This face mask has done me wonders. It blocks out all the glowing light in the room (and from the moon!) and rests smoothly on my skin. Plus, it prevents skin wrinkling that happens from snoozing on your pillows! LEAVE THE BABIES AND TODDLERS IN THEIR OWN BED. (This one is a super hard one for me — but I’m working on it.) As fun and delicious as snuggling is, co-sleeping comes with the price of defending yourself nightly from drop kicks and jabs. Leave the cuddly karate choppers in their own nests. EXPRESS YOUR GRATITUDE. If you go to sleep with gratitude and intention, you wake up with the same. Every night, I ask my girls to tell me 3 things they’re grateful for. It can range from “I am grateful for my family, my sister and the food I got to eat today” to “My Elsa dress!” Regardless, I want them to be conscious of our plentiful emotional nutrients and material fortune. Being aware and grateful will hopefully lead them to a life of contentment and being of service to others in the future. SET INTENTION. I say my prayers and then visualize what I hope to materialize the next day. So when I rise, I hit snooze once (assuming I didn’t wake up on my own), then meditate for 5–8 minutes — and then set out for the day.